Le double médaillé olympique sait comment se faire remarquer. Aucun athlète ne se donne autant dans ses costumes que le patineur artistique américain Johnny Weir. Le double médaillé olympique a définitivement fait sa marque dans sa discipline, en partie à cause de ses tenues extravagantes - dont il a souvent participé à la création. Mais le drame imposé par les tenues de l'Américain ne lui pas qu'apporté des éloges. En 2010, lors des Jeux de Vancouver, il avait été la cible de commentaires jugés homophobes de la part des commentateurs québécois Claude Mailhot et Alain Goldberg (analyste). M. Goldberg avait dit en ondes que le patineur «laisse une image assez amère pour le patinage artistique. (...) On pense que tous les garçons qui patinent vont devenir comme lui. Alors, c'est un très mauvais exemple. (...) On n'a pas tort de le décrier. Il a du rouge à lèvres, il s'habille de façon féminine, il essaie d'être le plus féminin possible sur la glace». Claude Mailhot en avait rajouté une couche en disant qu'il aimerait qu'il passe des tests gynécologiques pour prouver qu'il était bel et bien un homme, soulevant l'ire du Conseil québécois des gais et lesbiennes. Quoi qu'il en soit, plusieurs sont d'avis qu'il est bien que le sportif prenne autant de risques pour ses tenues que pour exécuter ses figures sur la glace. Coup d'oeil sur ses costumes éclectiques. 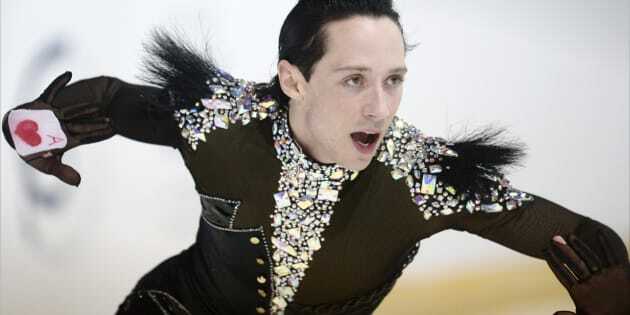 Johnny Weir ne patinera pas aux Jeux de Pyeongchang 2018. Il commentera cependant la discipline sur la chaîne NBC. Competing in the men's free program during the State Farm U.S. Figure Skating Championships at the Staples Center in Los Angeles on Jan. 10, 2002. Finishing his program in the men's free skate at the State Farm U.S. Figure Skating Championships on Jan. 18, 2003, in Dallas. Competing in the free skate during the State Farm U.S. Figure Skating Championships on Jan. 10, 2004, at Philips Arena in Atlanta. Competing in the short program during the State Farm U.S. Figure Skating Championships on Jan. 8, 2004, at Philips Arena in Atlanta. Skating in the Chevy Skating Spectacular during the State Farm U.S. Figure Skating Championships on Jan. 11, 2004, at Philips Arena in Atlanta. Performing at the Exhibition Gala at the 2004 World Figure Skating Championships in Dortmund, Germany, on March 28, 2004. Competing in the men's short program during the State Farm U.S. Figure Skating Championships at the Rose Garden on Jan. 13, 2005, in Portland, Oregon. Competing at the Japan International Challenge figure skating cup competition in January 2005. Performing during the men's qualifying free skate at the ISU World Figure Skating Championships at the Luzhniki Sports Palace on March 14, 2005, in Moscow. Performing his free skating at the Cup of Russia ISU Grand Prix figure skating event in St. Petersburg on Nov. 26, 2005. Performing his program at the exhibition of the Cup of Russia ISU Grand Prix figure skating event in St. Petersburg on Nov. 27, 2005. Competing in the men's short program during the State Farm U.S. Figure Skating Championships at the Savvis Center on Jan. 12, 2006, in St. Louis. Performing as part of "Champions on Ice 2006" at the HP Pavilion on Aug. 5, 2006, in San Jose, California. Performing in the men's short program competition on day two of Skate Canada on Nov. 3, 2006, in Victoria, Canada. Performing his men's free program at the Cup of Russia ISU Grand Prix of figure skating in Moscow on Nov. 25, 2006. Performing to "My Way" during the Marshalls U.S. Figure Skating Challenge on Dec. 10, 2006, at Agganis Arena in Boston. Performing in an exhibition during the State Farm U.S. Figure Skating Championships on Jan. 28, 2007, at Spokane Arena in Spokane, Washington. Performing in an exhibition program during the International Counter Match Figure Skating Competition, USA vs. Japan, at the Shin-Yokohama Prince Hotel Skate Center on Oct. 7, 2007, in Yokohama, Japan. Skating in the men's short program during the Cup of China Figure Skating competition, held at Harbin International Conference Exhibition and Sports Center on Nov. 9, 2007, in Harbin, China. During the men's free skating during the Cup of China Figure Skating competition, held at Harbin International Conference Exhibition and Sports Center on Nov. 10, 2007, in Harbin, China. Skating the men's short program on day 1 of 2008 Skate America at the Comcast Arena on Oct. 25, 2008, in Everett, Washington. Performing during Festa on Ice 2009 at KINTEX on April 24, 2009, in Goyang, South Korea. Performing in the men's free skating on day 1 of the ISU Grand Prix of Figure Skating NHK Trophy at Big Hat on Nov. 7, 2009, in Nagano, Japan. Performing in the Gala Exhibition on day 3 of the ISU Grand Prix of Figure Skating NHK Trophy at Big Hat on Nov. 8, 2009, in Nagano, Japan. Competing in the free skate during the U.S. Figure Skating Championships at Spokane Arena on Jan. 17, 2010, in Spokane, Washington. Performing his short program at the 2010 Winter Olympics on Feb. 16, 2010, in Vancouver, British Columbia. Performing on an episode of "Skating With The Stars" from November 2010. Performing at Artistry On Ice at Capital Indoor Stadium on July 16, 2011, in Beijing. Performing at the Ice Theatre of New York: Dare to Be Different gala at Sky Rink, Chelsea Piers, on Oct. 24, 2011, in New York City. Skating in the men's short program during the ISU Rostelecom Cup of Figure Skating 2012 at the Megasport Sports Center on Nov. 9, 2012, in Moscow. Skating during the Bank of America Winter Village at Bryant Park's Annual Tree Lighting Skate-tacular on Dec. 1, 2017, in New York City.